Sheet Size: 11" X 7.5"
Henri Fantin-Latour, in full Ignace-Henri-Jean-The´odore Fantin-Latour (born Jan. 14, 1836, Grenoble, France—died Aug. 25, 1904, Bure´), French painter, printmaker, and illustrator noted for his still lifes with flowers and his portraits, especially group compositions, of contemporary French celebrities in the arts. Fantin-Latour’s first teacher was his father, a well-known portrait painter. Later, he studied at the school of Lecoq de Boisbaudran and attended the E´cole des Beaux-Arts. He exhibited at the official French Salons, but in 1863 he also showed his work in the rebel Salon des Refuse´s. 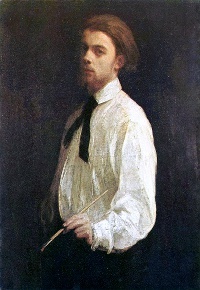 Although academic in manner, Fantin-Latour was independent in style. He had numerous friends among the leading French painters of his day, including J.-A.-D. Ingres, Euge`ne Delacroix, Camille Corot, E´douard Manet, and Gustave Courbet. His portrait groups, often arranged in rows of heads and figures like 17th-century Dutch guild portraits, are perhaps most interesting for their portrayal of various literary and artistic persons of the time. Fantin-Latour’s flower paintings were particularly appreciated in England, where, through James McNeill Whistler and Sir John Everett Millais, Fantin-Latour found a patron in Edwin Edwards. A wealthy amateur engraver, he supported Fantin-Latour for years by purchasing his still lifes. The last period of Fantin-Latour’s life was primarily devoted to lithography. In the Salon of 1876 he exhibited L’Anniversaire, honouring composer Hector Berlioz, and thereafter his lithographs were shown regularly. Most characteristic were his delicate portraits and imaginative drawings illustrative of the music of Richard Wagner, Berlioz, and others. He also illustrated Adolphe Jullien’s biographies of Wagner (1886) and Berlioz (1888). Sheet size: 12" X 8.25"
Image size: 8" x 5.5"